A proven 115 grain projectile in this load, the Hornady XTP, offers a great round for personal defense use. The fast round offers good penetration and the XTP offers significant mushrooming and deformation as well as uniformity and specific performance in the moment of impact. The delivery of energy is high for a 115 grain projectile and this Hornady custom ammunition gives a very good angle for those who prefer the slightly lighter recoil and the high penetration of the 115 grain 9mm load. 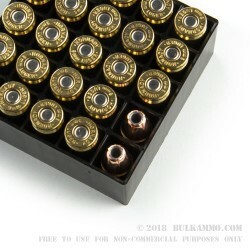 The penetration on these rounds exceeds 15 inches in a 10% ballistic gelatin and the 1155 feet per second velocity offers secure deformation and considerable opportunity to hit the strategic range for penetration as set by the FBI penetration protocol standard for personal defense and duty ammunition. The uniform expansion and the high diameter averages as well as the good weight retention that is experienced by the XTP projectile makes this a great round for the lighter 9mm fans. 341 pound feet of energy offers good knock down power out of a 9mm. This round is suitable for use in all 9mm firearms made in a mainstream production capacity. Ordered on Monday. arrived on Thursday. Great Ammo. 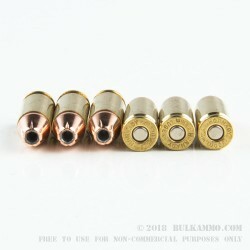 Q: What can you tell me in the way of a comparison of these to a frangible bullet? A: There is not much in the way of comparison between jacketed lead core ammo and frangible ammo. The former will retain weight when it hits something, while the latter will largely dissipate to nothing. 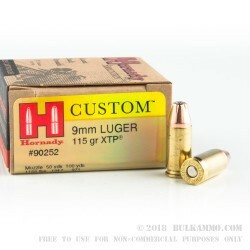 Frangible ammo is great for shooting steel targets up close, while jacketed hollow points like these 9mm Hornady XTPs are great for personal defense. Q: I'm a US Marine and I live in Military Base Housing. My Question is do you deliver to base housing? A: Yut. We'll ship wherever it is legal for us to do so. Some states and localities have restrictions that prevent us from shipping there.